The corporate denial of violation of human rights in the death of Berta Cáceres reveals the web of complicities and impunity that prompted her assassination. 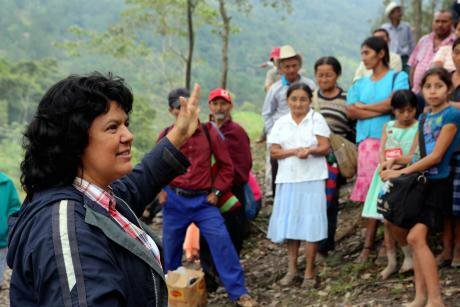 Berta Cáceres and local assembly community members campaigning against the Agua Zarca dam. Photo: courtesy of the Goldman Prize. Berta Cáceres was killed while sleeping in her home in La Esperanza, Honduras on 3rd March 2016. Over the past few years, she had been harassed, and received multiple death threats for her role in the movements she led opposing the Agua Zarca dam project. The project threatened to cut off the water supply to the Indigenous Lenca community in Honduras, depriving them of the right to sustainably manage and live off their territories and sacred river. Cáceres won the 2015 Goldman Environmental Prize for her work. But even before her death she had already paid a heavy price for her activism, because of which, her daughters and son had been forced to leave the country as their lives were under threat. Less than two weeks after Berta’s murder, 150 families members of the Civic Council of Popular and Indigenous Organizations of Honduras (COPINH), founded by Berta, were evicted from the community of Rio Lindo, Cortés, by the Military Police and the Special Force ‘Cobras’. And Nelson García, also a member of COPINH, who had assisted families evicted earlier in the day, was murdered. Caceres’ assassination, the obvious climate of widespread human rights violations, and overwhelming impunity in Honduras, have provoked outrage in the country and across the globe. This has manifested in massive demonstrations in Tegucigalpa, New York and elsewhere, in strong effort to put pressure on the government and corporations involved in the ring of complicity to Berta’s murder, to respond and put an end to the escalating violence. The Caceres family and members of COPINH however, dispute this position, pointing to DESA in a communiqué as the main source of multiple threats, persecution and aggression against the Lenca community and COPINH members. A deeper look at who is behind the Agua Zarca dam project points to both national and global complicities by financial institutions and corporations. At the national level, DESA is the local private energy company in charge of implementing the project. The company is partially controlled by the wealthy Honduran Atala family, whose billionaire member Camilo Atala recently turned his Grupo Financiero Ficohsa into the biggest financial conglomerate in Central America by acquiring most of Citibank’s assets in the region. The Atala family has done little to hide their support for the 2009 Honduras military coup that ousted democratically elected president Manuel Zelaya. With the backing of Honduras’s business elites, the Lobo administration that followed the military coup embraced the neoliberal development model with the slogan "Honduras is Open for Business" granting 41 hydroelectric dam illegal concessions in 2010 alone, including the Agua Zarca project. Most of these dam projects were granted on indigenous territory without prior and informed consent of the affected communities, and in blatant violation of International Labor Organization Convention 169, which requires that "consultation with indigenous peoples should be undertaken through appropriate procedures, in good faith, and through the representative institutions of these peoples". But the Agua Zarca project also has crucial international funding support from at least the Central American Bank for Economic Integration; the Dutch development bank FMO; Finnfund from Finland and German company Voith Hydro. The World Bank via the International Finance Corporation (IFC), the private sector arm, has denied their involvement in the project. Chinese state-owned Sinohydro Group, one of the largest hydropower engineering companies in the world, was the original contractor hired to build the dam. But in late 2013, Sinohydro decided to withdraw from the Agua Zarca Project, publicly citing ongoing community resistance and outrage following the death of COPINH environmental activist Tomas García who was shot and killed by the army near the project site. Responding to a query by the Business & Human Rights Resource Centre Sinohydro Group said: “Right from the very beginning of our mobilization, it was noticed that there were serious interest conflicts between the Employer of the Project, i.e. DESA, and the local communities, which were treated as unpredictable and uncontrollable to the Contractor. Therefore, Sinohydro Corporation Limited instructed to suspend all the site performance and ongoing preparations, and demobilized all his manpower from the project site on July 15th 2013.” The surprising withdrawal of the Chinese company in 2013 citing conflict with local communities however, did not elicit any doubts from the ostensibly human rights bastions, Dutch and Finnish backers of the project, who continued business as usual until Berta’s murder was too much of a scandal to conceal. However, the day after publishing the statement, FMO published a document on FAQ on the project clearly responding to the obvious negative attention following Berta’s killing. The document focuses only on the benefits of the project promising to “prioritize local recruitment and provide school materials to all students of the 11 communities”. In addition they say,“FMO is also aware that in many cases, our clients do not possess the knowledge and/or experience in implementing projects to the international standards of best environmental and social practice that FMO requires…”And so with a stated civilizing mission oriented towards “developing countries with weak governance” as the FAQs refer to Honduras, any doubts of complicity in violation of human rights are cleared. Green-washing corporate neo-colonialism at its finest. FinnFund decided to follow suit, to suspend disbursements to the project, though the CEO of the fund, Jaakko Kangasniemi, explained to Development Today “we still believe that the people in the affected areas want this project. But at this juncture we have to take a look at the situation”. The suspension of activities is a welcome decision; but is too little, too late. Suspending activities in Honduras is not nearly the same as pulling out permanently, something that COPINH members have been demanding for a long time. Attempts to wash the guilt away also holds true for the US State Department, who admittedly supported the coup in Honduras in 2009. In a short statement released March 4, it offers “the full support of the United States to help bring the perpetrators to justice”. There is absolute silence, as one can expect, about the permanence of US military aid and troops in Honduras that have only fuelled repression of social movements and violence, putting the country on the podium as “the deadliest place for environmental activists” according to Global Witness. Berta’s murder is not an isolated case fuelled by the specific context in Honduras but one of the most extreme examples of deadly complicity between unrestrained corporate power, government impunity and elites across the world. Examples abound: from the Niger Delta where women continue to challenge oil exploration by international oil companies; in Mexico where indigenous women are fighting to keep their communities’ land from large scale wind energy production projects; in Brazil where the collapse of a mining dam in 2015 resulted in deaths of the local community and continues to pose a risk to the survivors; in South Africa where pharmaceutical companies continue to block the access of affordable generic antiretrovirals to the poor and vulnerable communities infected with HIV; and in The Philippines where malicious attacks and threats perpetrated by State agents, against women human rights defenders (WHRDs) resisting repression and operations of mining companies increased in August 2015 prompting the condemnation of the Women Human Rights Defenders International Coalition (WHRDIC). There are millions of Bertas around the world that simply cannot be stopped by selected killings, for they are the seed in the persistence of struggles. “We must shake our conscience free of the rapacious capitalism, racism and patriarchy that will only assure our own self-destruction”, said Berta when she accepted the Goldman Environmental Prize. She was only describing the web of complicities and impunity that prompted her assassination. The corporate denial of complicity in the violation of human rights and death of Berta Caceres is green-washing corporate neo-colonialism at its finest.